A new era... The HH Sheikh Mansoor Bin Zayed Al Nahyan Global Arabian Horse Flat Racing Festival Darley Awards, and the HH Sheikha Fatima Bint Mubarak Darley Awards. 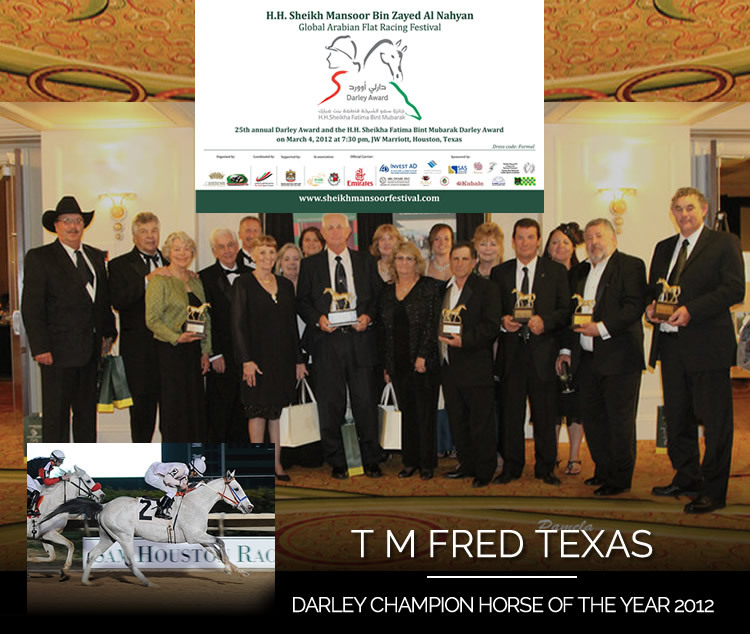 Houston, TX / USA - March 12, 2012 ~ The Board of Stewards of the Arabian Racing Cup is proud to announce the 2011 Darley Champions, crowned at the 25th Silver Anniversary of the Darley Awards. The Darley Awards, held annually, were founded in 1987 to honor the best in Arabian horse racing. This distinguished ceremony recognizes the most outstanding racehorses, jockeys, owners, trainers and breeders of the Arabian horse racing community in the USA. 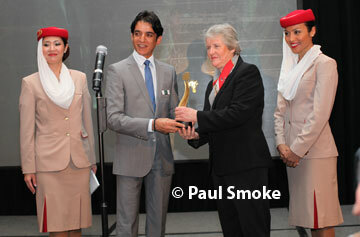 This year´s 2012 ceremony, named in honor of our sponsor as the HH Sheikh Mansoor Bin Zayed Al Nahyan Global Arabian Flat Racing Festival Darley Awards, was held March 4, 2012 at the JW Marriott in Houston, Texas. Dignitaries and guests from the USA and around the globe including Arabian race enthusiasts from Canada, Mexico, Australia, England, France, Sweden, The Netherlands, Turkey, Oman, Qatar, and UAE were present to witness this prestigious event. Mr. Omar Al Shamshi, Deputy Chief of Mission at the UAE Embassy in Washington, D.C. welcomed the gathering on behalf of the United Arab Emirates, and was on stage to present many of the awards. The glittering ceremony was capped by the ARC´s Annual Stallion Auction Fundraiser, headed by Patrick Buckley representing Abu Dhabi Equestrian Club, and Bill Smith, a noted trainer and UK Hall of Fame Steeplechase Jockey. Arabian Racing Cup, owner of the Darley Awards program, was chartered in 1983, founded by Dr. Sam Harrison and governed by a Board of Stewards. The Cup is dedicated to the promotion of Arabian Racing by expanding public awareness and creating prestigious programs to highlight the Arabian racing industry. Founded in 1983 by Dr. Sam Harrison, the Arabian Racing Cup (ARC)'s Darley Awards ceremony has become the showcase of U.S. Arabian racing. In 2012, the HH Sheikh Mansoor Bin Zayed Al Nahyan Global Arabian Flat Racing Festival and ARC joined together to promote this prestigious event. Supported by an extensive list of sponsors, the Darley Awards is under the direction of Lara Sawaya, Executive Director of the Festival, and organized by Arabian Racing Cup, the Abu Dhabi Tourism & Culture Authority, coordinated by Abu Dhabi Sports Council, in association with International Federation of Arabian Horse Racing Authorities, Emirates RacingAuthority, Emirates Arabian Horse Society, and supported by General Authority of Youth & Sports Welfare. Emirates Airlines is the official carrier.